It’s hard work, creative endeavour in the landscape and it is vulnerable on so many levels – security, weather, permissions, and just getting people there, off the beaten track of town routines. But the pay-off is gold – literally last Friday as the sun went down and its soft golden light filled the wide pale space of the Ilparpa Valley claypans. Wonderful when they are rain-filled but at their theatrical best when they are dry, they became the setting, after days of labour, for Franca Barraclough’s installation, Fractal Spirals In A Domestic Universe. The artist had made a similar spiral back in 2007 as part of her Cleaning Country series. Then it was installed at the Desert Park, an environment that is semi-domesticated. In that setting it was eloquent in its emphasis on obsessive accumulation and ordering. At the claypans a much sharper impression was achieved of imposition of an alien culture, arriving like a whirlwind in this country, sweeping up so much in its path. 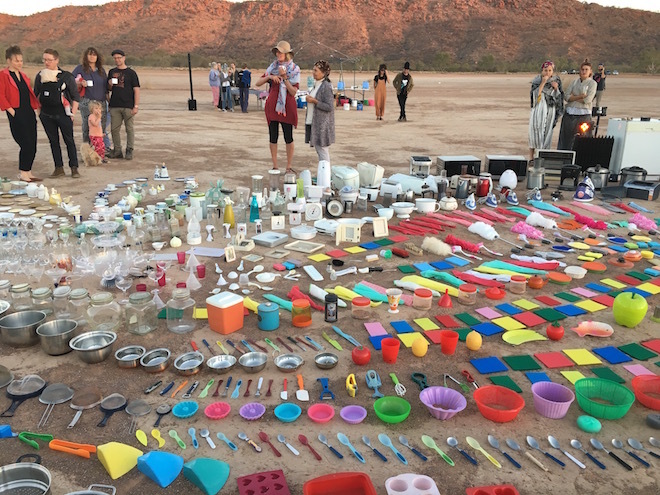 The work also resonated strongly with the current national debate around the proliferation of plastic (and other waste) in the environment and especially the oceans. 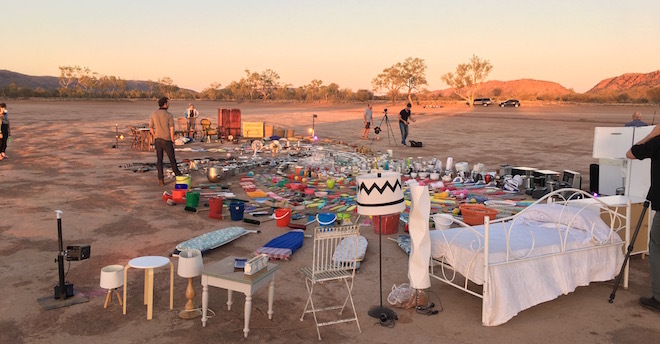 The installation was part of a program celebrating Watch This Space’s 25 years as an artist-run initiative in Alice Springs, Still Alive After 25. Opening tonight in the gallery are two exhibitions, Because The World Needs Us, by young First Nations women from Central Australia, and memory puddle by Caspar Connolly & Grace Pickford. Coming up, next Wednesday, is the second of a series of ART Talks offering a forum for reflection, challenge and future direction in local arts practice. This session will hear from artists practising in Central Australia who have roots in Aotearoa / New Zealand, speaking about how the different history of intercultural relations in their native country has affected what they have brought with them to The Centre and how it has influenced their practice. Speakers are Beth Sometimes, Suzi Lyon and Jennifer Taylor.